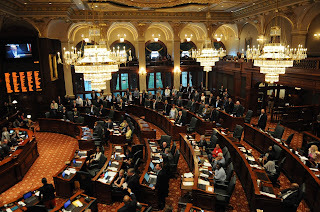 Illinois Democrats set aside a seven-month spending plan offered on Tuesday by Republican Governor Bruce Rauner, leaving a full-year budget the governor has vowed to veto as the most likely option to pass on the final day of the legislature’s spring session. 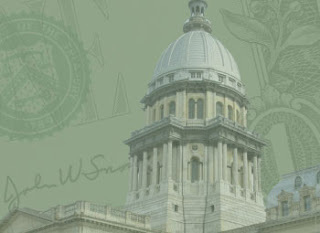 Rauner's administration proposed a framework for a short-term budget that would address unappropriated spending for the current fiscal year, which ends on June 30, and fully or partially fund key fiscal 2017 items including K-12 schools. 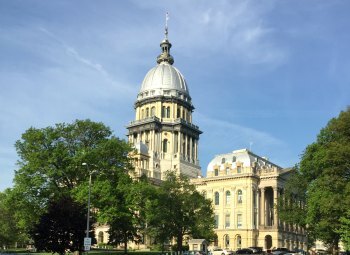 Illinois has limped through fiscal 2016 as the only U.S. state without a complete budget, operating under court-ordered spending, continuing and stopgap appropriations, and an enacted school funding budget. The impasse between Rauner and Democrats who control the legislature showed no sign of relenting. At issue are business-friendly and labor-weakening changes championed by Rauner and opposed by Democrats. Reuters has the story. Illinois is heading toward a second year without a state budget, putting some schools and colleges in jeopardy of closing and all but ensuring more social services and state programs will be cut amid a legislative standoff unlike anything the state has ever seen. 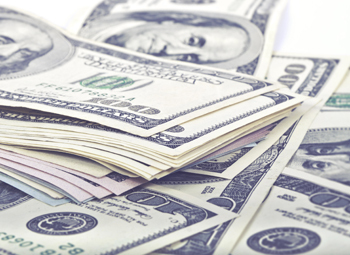 The state already has gone almost a full fiscal year without a budget. Democrats on Tuesday could give final approval to a spending plan for the new fiscal year that begins July 1, but Rauner has said he'll veto it because the measure spends about $7 billion more than Illinois is expected to take in without addressing additional revenues. Rauner instead is making a last-ditch effort to pass a short-term spending bill and provide money for schools -- an idea he opposed and some Democrats were pushing just days ago. Read the rest of the story in the Daily Herald. 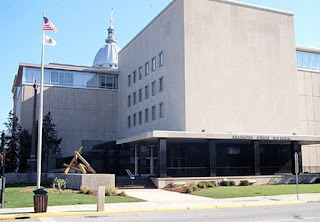 After months of work and discussions to make sure the State Museum opens its doors, State Representative Sara Wojcicki Jimenez today applauded the announcement by the Illinois Department of Natural Resources (IDNR) that they plan to reopen the Illinois State Museum on July 2nd. “This museum is a very important part of the Springfield community and the Illinois community as a whole. Its home to exhibits that allow us to learn about and connect with our state’s history. Today’s announcement is very good news for future generations who will continue to be able to explore their Illinois heritage at the Illinois State Museum,” said Representative Jimenez. “This session I’ve filed legislation and have done my best to work with all parties to make sure that this became a reality.” Read more. Gov. Bruce Rauner’s administration is making an about-face on the final day of spring session, suggesting that lawmakers approve a stopgap budget to keep schools, human service groups and prisons open through the summer in the hope a larger spending agreement can be worked out with Democrats who control the General Assembly. 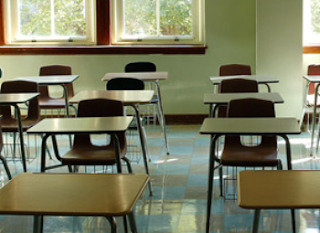 It’s a way for Rauner to try to head off a meltdown on education funding that could lead to schools throughout the state not opening this fall. 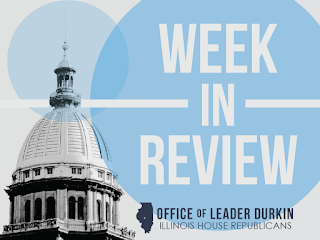 Heading into Tuesday, Democrats were poised to send Rauner a spending bill that is billions of dollars short and doesn’t come with the governor’s agenda items he has made a requirement for a broader budget deal. Rauner has vowed to veto the bill, which would mean state money couldn’t flow to school districts. Read more in the Chicago Tribune. 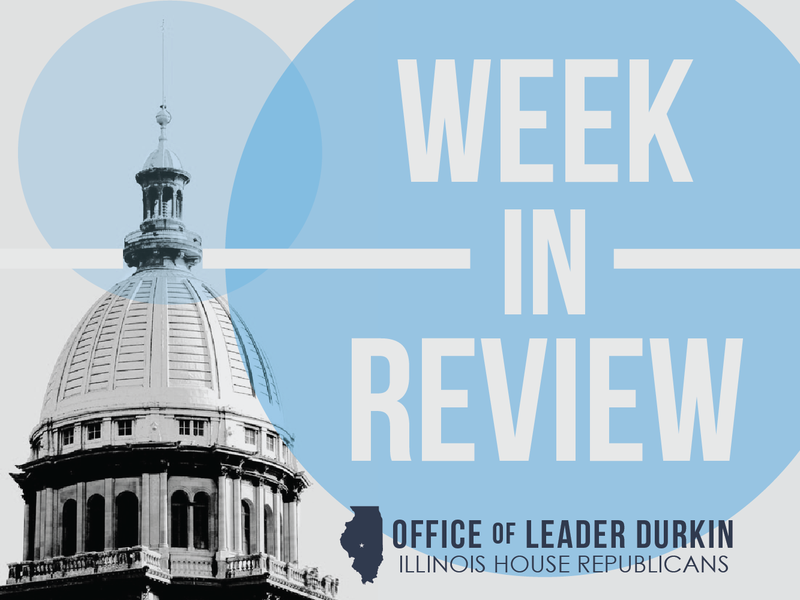 Acting to ensure that Illinois public schools open on-time this fall, House Republican Leader Jim Durkin (R-Western Springs) has filed legislation to fully fund K-12 education in Illinois for FY2017. With the regular session of the Illinois General Assembly scheduled to adjourn May 31, Durkin filed House Bill 6583 as an alternative to keep schools open in the event a comprehensive budget is not approved by Tuesday’s midnight deadline. “The Governor has made his commitment to strengthening our investment in K-12 education very clear, as well as the need to take students and teachers out of the political crossfire in Springfield by ensuring that public schools open on time this fall. 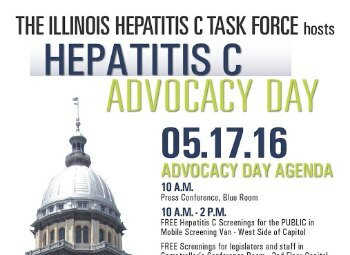 House Republicans stand ready to help the Governor make that commitment a reality,” Leader Durkin said. “I call on House Democrats to join us in this commitment. We cannot play politics with our kids’ education.” Read more. 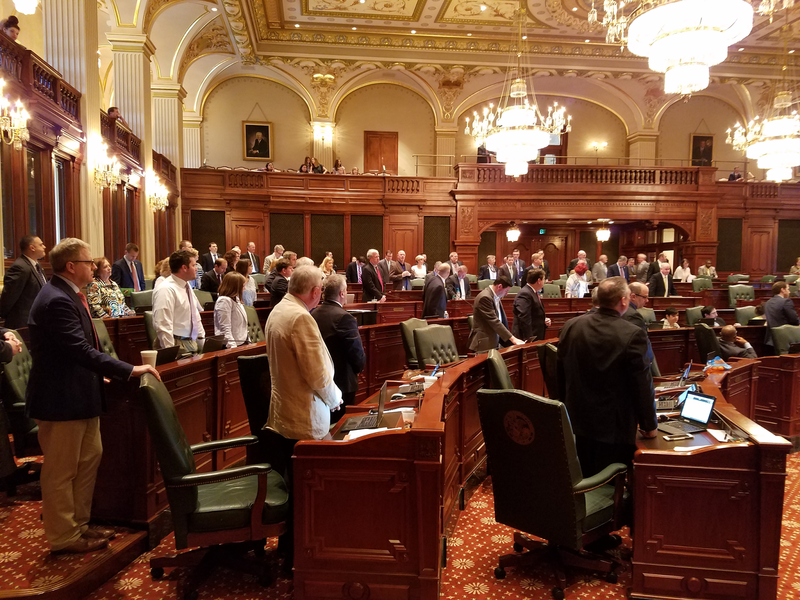 During the House floor debate on Friday, with only 4 days left in the regular session, Rep. Ron Sandack called on all legislators in the House to stand up if they are willing to stay the weekend and work on a compromise, comprehensive and balanced budget. Rep. Mike Tryon reminded the body that the role of the minority is to challenge the majority and to keep them to task. He urged them to stay and continue the job of the working groups. With just a few days left in the legislative session, Republicans urge Democrats to continue the efforts to find compromise and end the budget impasse. House Republicans hold a press conference immediately following the vote of an appropriation plan that spends $7 billion more in revenue than the state has coming into its coffers. House Republicans were denied a vote verification for a 500-page bill that was introduced a mere 90-minutes before it was called for debate on the House Floor. Democrats then limited the debate to less than an hour with a parliamentarian move. SB2048 appropriates $14 billion - that with court orders, continuing appropriations and consent decrees would push state spending over $40 billion. 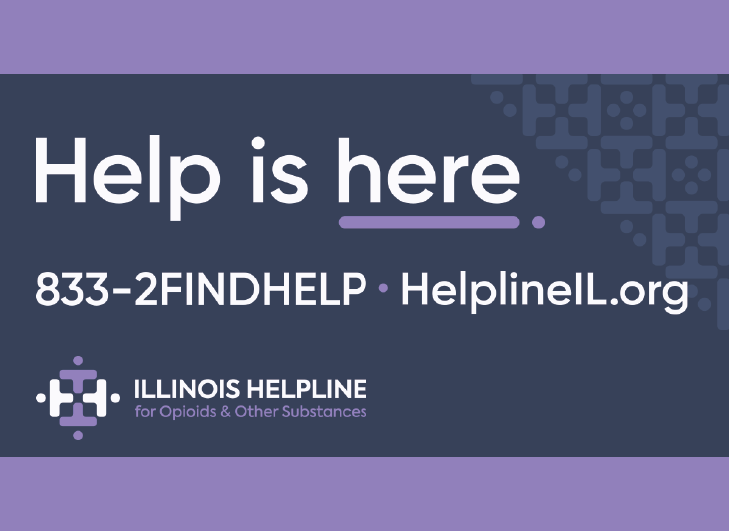 Veterans will soon see more flexibility in seeking help for addiction treatment and other mental health services according to the House sponsor of Senate Bill 3401, State Representative Michael McAuliffe (R-Chicago). The legislation would amend the Veterans and Servicemembers Court Treatment Act to allow Veteran’s Assistance Commissions (VAC) to provide assessments, mentoring, and treatment programs to veterans. Under current law, veterans can only receive such services at the federal Veteran's Affairs (VA) office or the Illinois Department of Veteran's Affairs (IDVA). “It is imperative that we provide our veterans with the best and quickest treatment possible,” Rep. McAuliffe said. “This bill will increase access to important services for veterans.” Read more. 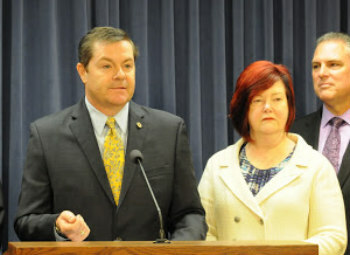 Legislation to crack down on the sale of synthetic cathinones, or “bath salts,” passed the Illinois House Tuesday without opposition. 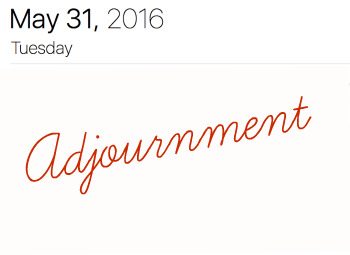 The bill passed the Senate last month, also without opposition, so it now goes to Gov. Bruce Rauner. These dangerous drugs, which can cause hallucinations and severe aggression in users, are often disguised and labeled as actual bath salts and other common products when sold. 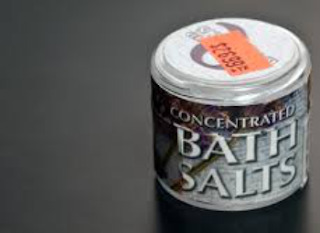 Under Senate Bill 210, retailers selling bath salts can lose their retail license and be charged with a Class 3 felony, which carries a fine of up to $25,000 and up to five years in prison. Read more on SJ-R.
Gov. Bruce Rauner and Republicans leaders Monday reiterated that lawmakers must pass reforms to workers compensation, pensions and other issues before they’ll entertain talks of a tax increase to balance the budget. Speaking at a Statehouse news conference, Rauner said he is “cautiously optimistic” that rank-and-file lawmakers will be able to negotiate compromises on reforms that Rauner said are essential to growing the state’s economy. Rauner and the four legislative leaders last week agreed to appoint people to working groups that would work on proposals for workers compensation reforms to control business costs, property tax relief coupled with local government cost controls and changes to pensions to save the state money. “These are not partisan issues,” Rauner said. “They are good government issues.” SJ-R has the rest of the story. Leaders meet to discuss budget negotiations, but many obstacles remain. The four legislative leaders met with Governor Rauner for only the second time this year on Tuesday, May 17. 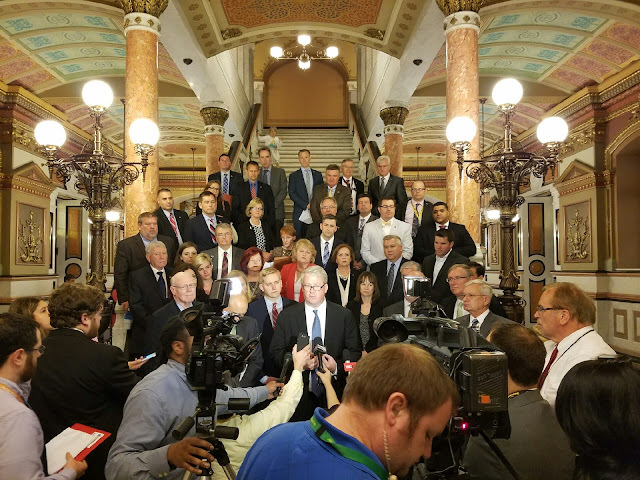 The leaders agreed to deputize lawmaker working groups, including key members of the House Republican Caucus, to discuss specific issues relevant to an agreement. 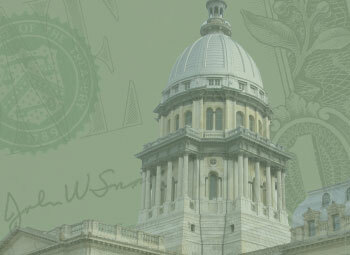 The Illinois budget process has been stalled by an impasse that has now gone on for nearly 11 months. 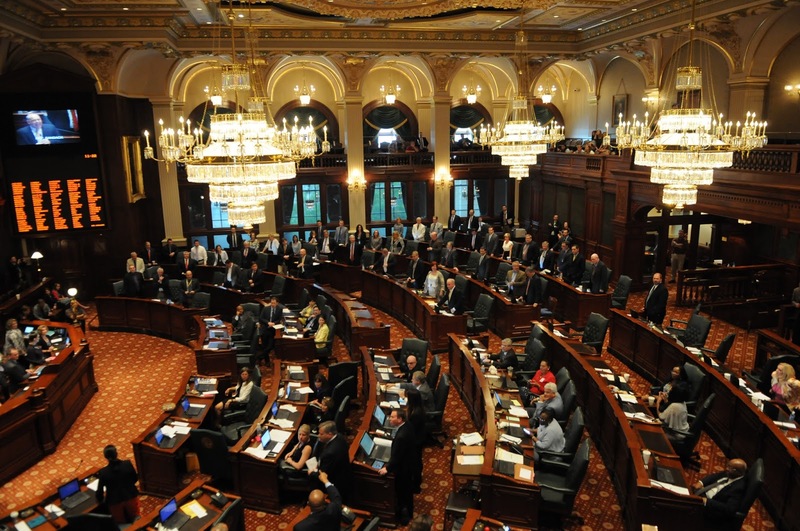 Illinois began operating without a constitutional balanced budget to control spending on July 1, 2015, and is now the only state not to have a budget for the current fiscal year. Illinois Secretary of State Jesse White announced that his office is upgrading security features to the Driver’s License/ID card design and expanding the central issuance process for driver’s licenses and ID cards to all applicants. 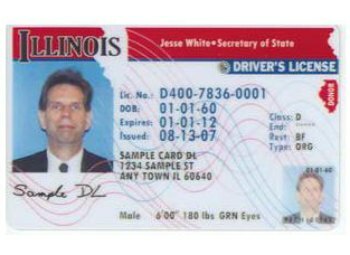 With implementation of these changes, Illinois has moved closer to achieving full REAL ID compliance which is a federal mandate of the U.S. Department of Homeland Security (DHS). 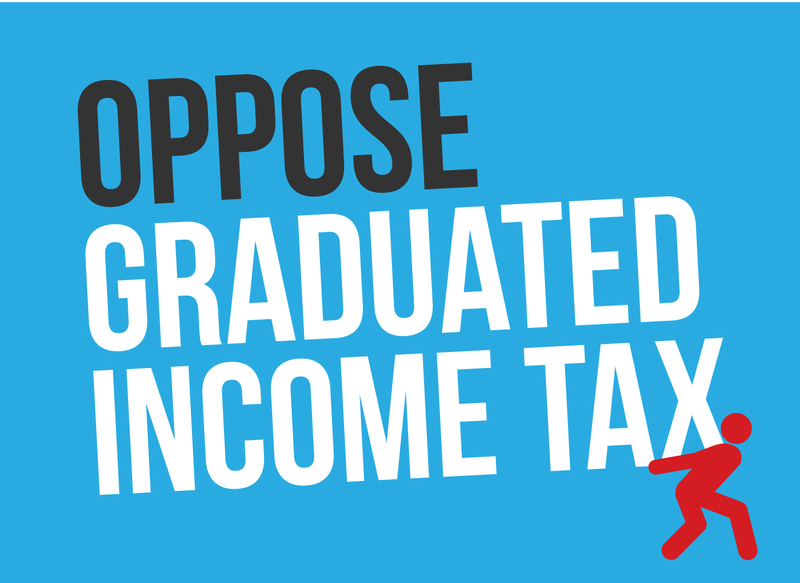 Last week, the Illinois State Board of Education heard presentations from two groups of committed community members wanting to make changes to the current K-12 funding formula. 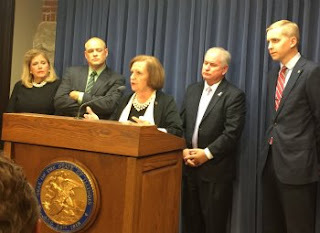 Both groups included educators, legislators and parents who have worked long and hard to address the inequity and inadequacy in the way that Illinois funds schools. As a religious leader, a former legislator and the current chair of the Illinois State Board of Education, I applaud their focus and hope that together we can find a resolution that will allow more children in Illinois to graduate from high school ready for a high paying job and a rigorous college program. Read the rest of the letter to the editor by James Meeks in the Chicago SunTimes. On Monday, State Representatives Patti Bellock and David McSweeney joined a panel of legislators at the City Club of Chicago to discuss the current state of the Illinois Budget. See the video here. Rep. Christine Winger continues to stand with residents adversely impacted by O'Hare Airport. 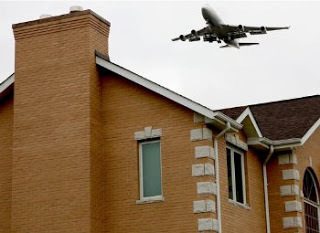 In April, Winger sent a letter to Attorney General Lisa Madigan asking her to take action to protect the health of those affected by noise and pollution generated by operations at O’Hare. According to the Attorney General's website, "One of the primary responsibilities of the Attorney General's office is safeguarding the public by protecting the environment. Attorney General Madigan plays a significant role in protecting the health and welfare of all Illinois residents and strives to provide a future that will include a safe environment." Read more. 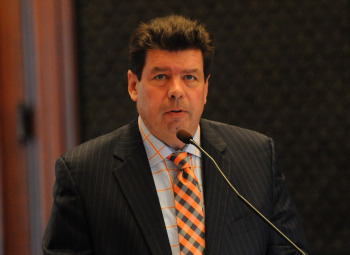 A group of Illinois lawmakers began in February formally requesting that Auditor General Frank Mautino work expeditiously to answer serious questions about campaign expenditures and reporting procedures dating back to his time in the Illinois House of Representatives. Today, more than three months later, lawmakers stressed that Mautino’s foot dragging needs to stop. “Our first letter to Auditor General Mautino was sent on February 1st. He requested a bit more time to which we willingly agreed. At the end of February, he told us we could expect an answer within weeks. But now we’re in the month of May, and these questions are still festering because he simply won’t address them,” said State Representative Grant Wehrli (R-Naperville). “If there’s nothing improper, as he asserts, then why won’t he simply answer the questions so he and we can put this issue behind us?” Read more.